You may or you may not have bought my book about Hasse Ekman, The Man from the Third Row, but either way I thought I should post something to give you a taste of it. What follows is copied from the book with a few changes, partly to remove references to other parts of the book so it can stand on its own. It is about what might be my favourite Ekman film. 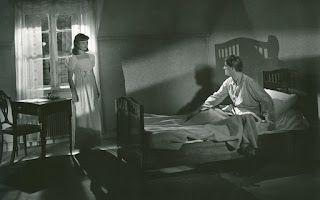 Hasse Ekman made three films in 1945 and the best of them is Wandering with the Moon (Vandring med månen), his second collaboration with the writer Walter Ljungquist. This time Ekman was for the first time not working with the production company Terra and producer Lorens Marmstedt but for the rival studio, SF. The reason he was working for SF instead of Terra was that SF owned the rights to Ljungquist’s novel Vandring med månen, and the new head of production at SF wanted Ekman to make it into a film. Ekman agreed to do it on condition that he could give a part to the actress Eva Henning and work together with Ljungquist on the script, to which SF agreed. Wandering with the Moon tells the story of a young man, Dan (played by Alf Kjellin), who has a fraught relationship with his father and after a heated argument in which Dan says “I can't stand you. I can't stand myself, and I can't stand my office”, he decides to leave home and go abroad. He is walking along a deserted country road, talking to the moon, when a bus with a travelling theatre group comes along and the driver asks for directions. One of the actresses, Pia, jumps of the bus and asks Dan if she may walk with him and, hesitantly, he says yes. For the rest of the film we follow them, walking, talking and meeting various characters on the way over the course of a few days. It is not a film with a clear linear structure but rather an episodic, lyrical narrative. It is also a film about innocence and innocence lost; and, which often goes hand in hand with this, virginity and sexual inexperience. The first night Pia says to Dan: “Do you want to be my lover? I've never been with another man.” He cannot deal with this revelation; the thought of her and possibly himself as sexual beings makes him uncomfortable and even disgusted. But at the end of the film she finally makes him succumb, and they are both in a sense liberated. Their walk together in the beginning is done in one long take and then the sequence is repeated in the last scene of the film - yet another example of how Ekman in his films often links the beginning and the end together, here with Dan walking on a country road, talking to the moon. The difference is that whereas he was alone in the first scene, in the last scene he is with Pia. Dan and Pia meet many different characters along the way and it is illuminating to look more closely at some of them. On his own Dan first meets a vagabond, played by Stig Järrel. The vagabond has an ironic and open-minded approach to life and misery. A poet and a philosopher, he takes things as they come and argues that nothing is important; that he himself is an insignificant being, one “whose name is written in running water,” as he puts it. However, he praises the youth and is anxious for the couple to get a head start, before they too become cynical. This is the one thing that connects the various characters Dan and Pia encounter: the wish to protect and/or pity the young for the experienced know that the idealism and hope of the young will inevitably give way to the cynicism and disappointment of adulthood and maturity. They meet a careworn old woman (played by Hjördis Pettersson) who is the keeper of an inn where they spend the night, and she tells them that only those who gamble in life will really live. They also meet a priest (Hilding Gavle) who, when Dan confesses that he is an atheist, says: “Well, I prefer an honest atheist to a dishonest Christian.” But another piece of advice that everyone they meet gives is that in order to get ahead in life, they need to learn to use masks, to hide their true identities, because, as a man played by Ekman says: “Everybody walks around with a mask.” The woman at the inn says that in order to remain sane and be able to function in the world “[y]ou must always try and be something other than you really are” and use irony as an escape mechanism. At one point when Dan is exasperated with all the hopelessness and cynicism he encounters, he demands to know if there is no belief in goodness, to be told: yes, there is goodness, but it is so desperately fragile. Yet despite these sometimes uncomfortable truths, most of the people they meet see something hopeful in the love and idealism that Dan and Pia radiate. It is as if these people become spokespersons for different ideas, for Ekman's view of life, as they speak of the need to hide behind masks, of the apparent inevitability of cynicism and boredom, how experience and conformity stifle life. At the same time there is also hope: the hope of breaking free from conventions and traditions, for example by devoting oneself to the arts, in particular the theatre. These themes, together with the loose narrative and the poetic imagery, are also what make this film a good example of the similarities between Ekman and Jean Renoir, and their shared sensibility. The poetry of the film remains one of its main strengths and part of that is due to the episodic structure and the lyrical images of the countryside. The cinematographer this time was Gösta Roosling, who hardly ever worked on feature films. His expertise was in newsreels and documentaries of people and nature. It is possible that Ekman chose him for this purpose. That was from chapter 4, and the book is available at online book stores and assorted libraries and such. I might add that Jean Renoir is a frequent reference point in the book. Spring of 1997 was a pivotal time for me in several respects. I moved out for the first time, leaving my parents to move in with some friends instead. I went on my first trip abroad by myself (to Rome) and found it so simulating I often wish I did nothing else. I sent my very first email. And, more relevant for this blog, this was also the year I had my first film article published, in the Swedish film journal Filmrutan. 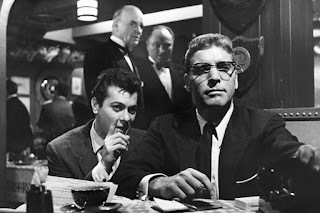 The article was about Alexander Mackendrick, and I have been writing for Filmrutan ever since. So I have been writing about film professionally, more or less, for 20 years as of now. I felt this was cause for a self-celebratory post. In addition, I just had my 250 000th visitor at this particular blog, and although these statistics are not exactly foolproof (how many of these visitors are bots or web crawlers?) they still mean something. So I figured I could celebrate that too. Curtis and Lancaster, directed by Mackendrick in Sweet Smell of Success (1957). 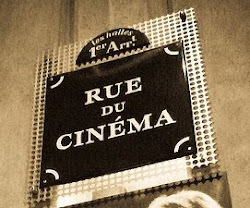 For the first couple of years Filmrutan was the only place for which I wrote, but then I began writing for a now defunct journal called Cinema, published by Stockholm International Film Festival. That was around 1999-2001, and it was great fun. I wrote reviews, both long ones and capsules, did some more journalistic assignments and also several interviews with interesting filmmakers, for some reason primarily from the eastern parts of Europe, such as Jiří Menzel, Jasmin Dizdar, János Szász, Milcho Manchevski and Pantelis Voulgaris from Greece. As you can see that is a very disparate collection. I have been blogging since 2005 (first a Swedish film blog and then this one from 2009 when I moved to Scotland) so that is 12 years of almost uninterrupted blogging, yet I never know what will turn out to be popular and what will not, and I am usually surprised. I wonder if I will still be writing 12 years from now. But first I must think of something to write for next week. This post does not really count.